One of the earliest subjects depicted in art was war. This should be no surprise, as it is a human activity that provokes great emotions. From the stelae of ancient Egypt, to the tapestries of Medieval Europe and the war artists of the 20th century, military art is widespread through human history. In Afghanistan, one of the most common art forms that is indigenous to the country is the weaving of carpets. It is likely that some of the very earliest carpet weavers in the world were found in Afghanistan, likely starting over two millennia ago. Tribal designs rooted in different parts of the country, or amongst particular ethnic groups, are well known amongst carpet connoisseurs. After nearly constant conflict in the country since 1979, it shouldn’t be a surprise that these two strands of history would cross and become knotted together. Afghan carpets are one of the lesser known artistic mediums used to depict war and conflict, with fascinating results. Afghan “war carpets” are one of the richest forms of war art to be found in the 20th and 21st centuries. The origin of war carpets seems to be in the time frame immediately after the 1979 Soviet invasion, though it is unclear exactly where in Afghanistan it may have started. Early war carpets were relatively subtle, with traditional symbols such as flowers, birds or geometric patterns replaced by images from the weaver’s reality – bullets, tanks, helicopters and mines. These early war carpets were meant entirely for “domestic” consumption, though many were made by the Afghan diaspora in refugee camps in Iran and Pakistan. They could be seen as a subtle form of resistance, as they represented the militarization of Afghan culture in response to Soviet occupation. I bought my first war rug in a carpet shop in Peshawar in 2001, while the Taliban still held sway over most of the country. My request for that particular kind of carpet was met with a hurried stream of orders from the carpet dealer to his sons, who fanned out though the market to borrow war carpets from other vendors. We sat and drank tea while we waited, and the carpet vendor seemed a little incredulous at my desire for this very specific kind of carpet, given the hundreds of others piled in his shop. With the fall of the Taliban, there was a massive influx of Western soldiers into the country, all with disposable incomes and a desire for souvenirs. Their presence breathed new life into the production of war rugs, and new designs became more common. The most commonly seen portrayed a stylized map of Afghanistan, often with US and Afghan flags, and a series of individual pictures of tanks, planes, and other machines of war. Many English words began to appear on the carpets as well, with mis-spellings and obscure meanings being common. And as Afghan culture has been influenced by the heavy presence of foreign dignitaries, soldiers and aid workers, this too has been captured in the war rug’s imagery. One popular carpet design depicts the events of 9/11, with airliners shown crashing into the World Trade Centre. This event, on the other side of the world, marks the impetus for the latest war in Afghanistan, but the imagery is also a reflection of the West’s messaging to the Afghan people. In the early days of the conflict against the Taliban, Western propaganda leaflets showed the attack on the World Trade Centre to explain the reasoning behind the intervention. The pamphlet reads: ““20th September, 1380. World Trade Center The Coalition Forces came to arrest those responsible for the terrorism against America. They also come to arrest anyone that protects them. More than 3,000 people in the United States of America were murdered in these attacks.” The “9/11” style war rugs, then, are a reflection of our own stated reasons for being in Afghanistan. The latest carpet design to have become popular is the use of images of “drones,” a key part of the war in Afghanistan as well as operations in the tribal areas of Pakistan. While the Afghan diaspora in Pakistan moved there to escape the conflict in their homeland, it is interesting that this aspect of modern war unites them with those people who remained or returned to Afghanistan. The idea that carpets can be an art form that reflects current events is unusual, even allowing for the “juxtaposition of a tool of 21st century war depicted on a millennia old medium. Another interesting aspect of war rugs is that, traditionally, carpet making has been done by women. There are few public forums in Afghanistan for women to express themselves, and even fewer that reach outside of the country. Carpets give perhaps the widest international distribution to the artistic vision of Afghan women, and one wonders if war rugs provide a female-centric view of war and society in Afghanistan. The military draw-down in Afghanistan has created new challenges for carpet vendors, many of whom have found their sales dwindling to almost nothing. It is likely that many of the designs aimed squarely at the souvenir market will stop being produced, as the weavers “follow the market” and find new customers. 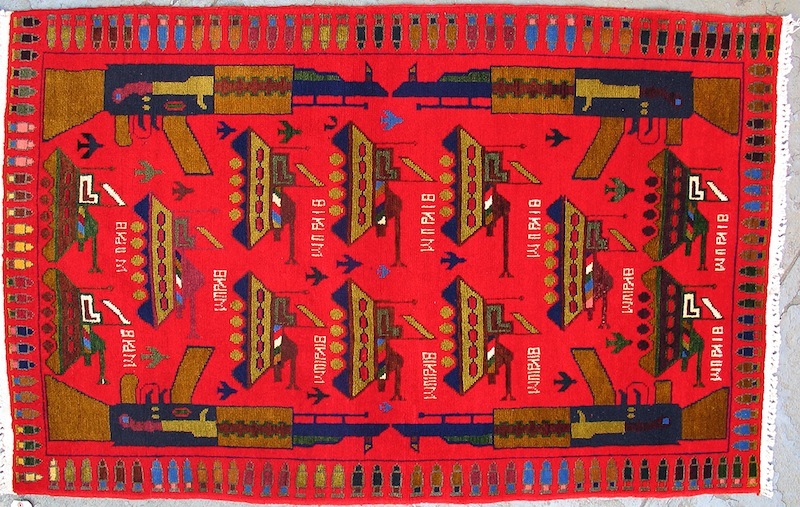 Whether they were produced to suit foreign or domestic tastes, war rugs are a unique medium for the capture of cultural stories about war. It’s only natural, perhaps, that the nearly ubiquitous nature of conflict in Afghanistan over the past four decades has been woven into the fabric of its art.